Most discussions of the origin of the elephant as the symbol of the Republican Party credit Thomas Nast and his Harper’s Weekly cartoon of November 7, 1874, “The Third Term Panic.” Political commentator William Safire does so in his New Language of Politics (1972). However, Safire and others following his lead also mention an alleged appearance of an elephant in the pro-Lincoln campaign newspaper of 1860, The Rail Splitter. 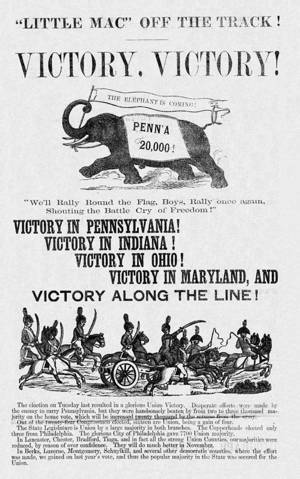 Although an image of a stampeding elephant was published in the Chicago version of that partisan periodical, it was part of an advertisement for a Chicago shoe store, Willet & Co. The elephant in the ad wears boots and carries a banner in its trunk labeled “Good Boots and Shoes.” Located on the back page of each issue, none of the Willet advertisements make any direct or indirect reference to the Republican Party in particular or politics in general. The image does not appear in the Cincinnati edition of The Rail Splitter (1860).